'The first thing to be regarded is the accurate admeasurement of the foot of the person for whose use the shoe is intended, which is a very simple process. When this is ascertained, the next step is to procure a last precisely of the same dimensions. This is an exact imitation of the foot, the making of which is quite a distinct profession from that of the shoemaker. 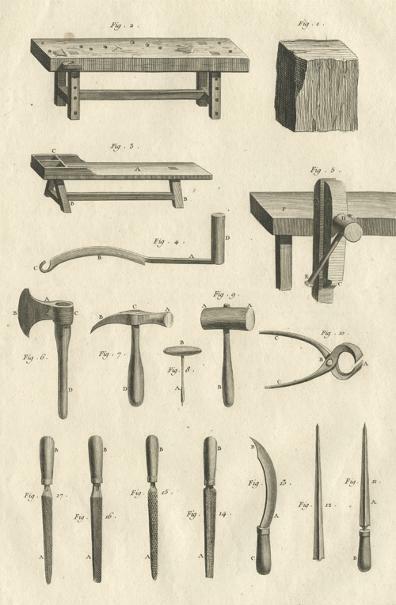 To cut leather to the best advantage requires much more art than may appear at first sight to be necessary; but it is an undoubted fact that many an industrious workman has been ruined in consequence of his want of skill in this particular. Ingenuity, together with a good deal of practice, are necessary to acquire it. The cutting knife is in the shape of a crescent. Although 'cordwainer' means a shoemaker, the title tends to be used by those wishing to show themselves as belonging to a certain class. Cordwainers always worked with new leather, as distinct from cobblers, who repaired and reused old. A release dated 1711 concerning Little Sparnham, Ashburton, involves Thomas Bastowe of Ashburton, cordwainer. In 1737 there was a presentment (ie a formal statement) to the Quarter Sessions regarding John Moore of Ashburton, cordwainer. He was a searcher and sealer of leather*, but had refused to search and seal one hide of leather belonging to Nicholas Tapper. The goods were valued at twenty shillings. *This appears to have been a form of quality control. See The Acts of Assembly of the Province of Pennsylvania, Philadelphia 1775, p108, which presumably followed the pattern in England. 1739 James Tapper, cordwainer, was Portreeve. Gifford's main love was mathematics, but had no pen, ink or paper to practice with. 'I beat out pieces of leather as smooth as possible, and wrought my problems on them with a blunted awl...' He also began to write verse - eventually having enough subscribers to pay his master six pounds to release him from his apprenticeship. 1767 Mathew White, cordwainer, was one of the parties to the lease of a dwellinghouse over the arch in North Street. Roger Maunder, cordwainer, is one of the parties to a lease of Sparnham, Ashburton, in 1779, together with his wife Margery. In 1792 Roger Maunder, cordwainer, North Street, was named in an insurance document. Tho. Mugridge was a boot and shoemaker in the Universal British Directory of Trade, Commerce and Manufacture, Vol 2, late 1700s. Among the Marriage Bonds and Allegations held at the Devon Heritage Centre is one for the marriage of Thomas Whiteway and Eleanor Smerdon, 2nd April 1816. Thomas, a widower of Ashburton, was a shoemaker, and Eleanor, a spinster, was a sojourner in Stoke Damerel. Two petitions were presented to the House of Commons on April 9th 1816. One was from the tanners, curriers and shoemakers of Ashburton, concerning the taxes upon leather. George Haberfield was baptized in April 1816. His parents were Charles, a shoemaker, and Mary. Another son, Richard, was baptized in April 1821. When Joanna, the daughter of Anthony and Joanna Martin, was baptized in October 1819, her father's occupation was that of shoemaker. Elizabeth, another daughter, was baptized in March 1821. Thomas Smerdon married Ann Bennett Week(e)s at Ashburton in April 1781. He had been baptised at Ashburton on the first day of January 1761; she at Wolborough Street Salem Independent Chapel in 1782, so their ages at marriage were roughly 20 and 19. The will of Thomas Smerdon of Ashburton, cordwainer, was proved in the Prerogative Court of Canterbury in 1831. (4) Mary Harris, the wife of Richard Harris, a painter and glazier in Totnes (she inherited the dwelling house in North Street, currently occupied by Edward Bryant) Mention was made of her son Thomas Smerdon Harris. (5) Ann Strawbridge, wife of John Strawbridge, an excise officer in Bristol, and her children John, William and Thomas. (6) Charlotte Stephens, the wife of Robert Stephens, a yeoman (?) of Woodland. (7) Lydia Pope, the widow of William Pope, a miller. Her children William Henry Pope, John Pope and Thomas Smerdon Pope were to benefit after her death. She was to inherit the north or higher side of the passage into the dwelling house in North Street after the death of her mother - the lower or south side of the property was to go to Eliza. Grandchildren Lydia and Mary Ann Smerdon (daughters of William) also had bequests, as did Ann Bennett Smerdon, daughter of Thomas. The remainder of the estate was to go to Thomas's sons Thomas and Richard. See Miscellaneous Documents under People and Properties for a document concerning Lydia Pope. The Devon Archive and Local Studies Service holds the record of a draft lease dated 1832, concerning a dwellinghouse, curtilage and garden in East Street. One of the parties is Margaret, the wife of Edward Pears of Devonport - formerly she was the widow of George Monday, cordwainer, of Ashburton. 1848 William Mitchelmore, shoemaker, summoned William Brimmicombe of Torquay for a debt of £2 15s 11d. Mitchelmore had done work for both Brimmicombe and his daughter, and claimed that Brimmicombe had promised that he would pay the total amount. Brimmicombe's daughter had ordered boots, entered into the shoemaker's books as 'whole soled, bound and buttoned'. Brimmicombe denied promising to pay for these, saying that his daughter was 30 years old and he had nothing to do with her debts. It appears from the report that Brimmicombe only had to pay for the work done for himself. 1853 Elizabeth Skews summoned Thomas Ireland Searle, shoemaker, for the maintenance of her illegitimate child. The Bench ordered him to pay 2s 6d a week plus £1 0s 6d costs. Samuel Henry Chalk was baptised in April 1832, the son of Samuel Chalk, a carpenter, and Maria Brown Chalk. At the time of the 1861 census he is a master cordwainer, employing one boy. He and his widowed mother are the next entry on from Thomas Bowden, a journeyman cordwainer. By 1871 Samuel, now married with a daughter, is employing two men and a boy. On the census of that year he calls himself a shoemaker. Ten years later his nephew Albert Fletcher, aged 16, is a shoemaker in the same household. Samuel's daughter Flora R is assisting him in 1891. She is a 'boot & shoe shop assistant' in 1901. Although Samuel spent most of his life in Ashburton, towards the end of his life he appears to have gone to live with his daughter and her husband in Lewisham, London. This is where he is on the 1911 census, aged 78 and a widower. He died in the September quarter of that year. William Smerdon, shoemaker (son of John), 1 Bovey's Cottages. Six of the above, all women, were boot binders. John Giles, aged roughly 55, and his wife Mary, are living in North Street in the 1841 census. John is a cordwainer. In the 1851 census 45 year old John Giles and his wife Elizabeth are living in East Street. With them is their son, Henry, aged 19, who like his father is a cordwainer. There are three daughters including Thomasin and Ann, and John's 70 year old father, also called John and also a cordwainer, is with them. James Abbot, a 21 year old apprentice cordwainer, is also in the household. John Harding married Anne Giles in the Newton Abbot district, in the June quarter of 1860. By the time of the 1861 census they had a 3 month old son, John C. 21 year old John was a watchmaker; his wife was 22. 2 girls were born with the surname Harding and the mother's surname Giles after 1864: Elizabeth Ann in 1865, and Thirza in 1867. Both births were registered in the Newton Abbot district. A notice in 1869 called for all debtors and creditors to the estate of John Harding, jeweller, Ashburton, to come forward before the 30th April. They were to contact Messrs Giles and Son, Boot and Shoemakers, Ashburton. In the 1871 census John Giles, a boot and shoemaker aged 65, is living in East Street with his wife Elizabeth. With them is his niece Elizabeth Harding, aged 5, who was born in Ashburton. In 1871 Henry Giles and his wife Frances Newham Giles were living in West Street. Henry was a master boot and shoemaker employing 4 men and 2 boys. In the household on census night were their 5 children, and nieces and nephews John E [C?] Harding, John Harding, William Harding, Francis N Rowland and Kate Rowland. By 1881 Henry and Frances are living in East Street, probably in the property at the junction of East Street and North Street. Of the 5 children living with them Robert, aged 16, is a bootmaker; also in the household is Charles Harding, Henry's nephew, who is also a bootmaker. George Rowland Giles is a boot and shoemaker at the corner of North and East Street in the 1901 census. 31 years old and born in Ashburton, he is living there with his wife Elizabeth and three young children. A postcard from the early 20th century (sold privately, not in my possession) shows a business with the name Giles, on the property that is now 2 North Street. In 1874 magistrates sent William Thorn, shoemaker, to prison for seven days for being drunk and riotous. George Shillabear, shoemaker, was summoned in 1876 for trespassing at Welstor in search of conies. He paid a 16s fine. In 1875 Mary Martin summoned Mary Field, the wife of a shoemaker, for assault. Field had thrown a bucket of water over Martin, after the latter had allegedly spread an 'evil report' about her. Field said that she 'was so aggravated that she could not help what she did.' She was fined 1s with 6s costs. 1879 Thomas Bawden, a shoemaker, was charged with being drunk and disorderly at Christow. He was fined 13s including costs. In the 1881 census 69 year old John Eales, shoemaker, is living at Browses Buildings. With him is his wife Sophia, married daughter Elizabeth Keat, and three grandchildren: Francis, 3, Ellen, 2, and William, 2 months old. John had been born in Brent, Devon. William Thorne, shoemaker, was fined 1s for being drunk and disorderly in the streets in October 1884. He was also charged under the Poaching Prevention Act, but as there was some doubt about whether or not he had permission to be on the land in question, the case was dismissed.